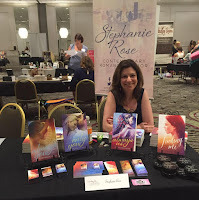 Stephanie Rose is here, My Little Pretties! She's dropped by to answer our Questions, and play show and tell with her books and all her links! Check it out, then go grab all her books! ...if you haven't done so already. I love a good romance, with real characters. Not that I don’t love to read about billionaires or rockstars, but I like writing typical guys and showing how amazing they can be. My birthday haha. My friends and family kid that I treat it like a holiday because it’s my favorite day of the year. If I had to choose, Italy. I’d love to see where my family came from and from what I hear it’s a gorgeous place to go. My cell phone, baby hair clips to put the front of my hair back, and lipstick. The people I know always inspire me. There are pieces of them in all the characters that I write. As a romance writer there is a lot…I think vaginal steaming since I read it in a book and thought for sure it was made up. Be kind. Treat others like you would want to be treated. It’s simple but the most important. I’d love to go back to the 80s. I was a kid and didn’t get to fully appreciate it. I look for nice shoulders and forearms. I guess I’m a little weird. But the most attractive thing about a guy is his attitude. A nice guy with a great sense of humor is the sexiest thing in the world. Briefly, I’m a funny, affectionate person who likes to curse a lot. Then I fall asleep. Small window. Zumba to Zimbawe, and I wish my phone would realize I don’t say duck all the time. Maria by TKA, its freestyle so not sure it will resonate, but that song brings back a ton of memories. Cheese and that’s it usually. I eat them big time. Batman. No one beats Batman. Only You, no doubt. I’d love to bring worldwide attention to Lupus, and there were so many different love stories in it. Mia Sheridan. She’s a brilliant writer and a class act. Nope, too scared to. Not that I have such an interesting life but you never know what you’ll find. I have lupus, so writing Only You was probably the most difficult undertaking I’ve ever had to do. Everything that happened to Paige happened to me. At a recent signing, a reader with lupus thanked me for writing Only You. What writers do is a privilege, and we should never forget that. Clutter Queen no doubt. I’m the Oscar to my husband’s Felix in Odd Couple terms. Mean people. No reason for it. Always have to speak your mind. No real set plans, I just want to get better as I go. I owe to my readers who have been with me since the beginning. Check back again to see who else stops by to play 20 Questions with us! What a great interview! It's always fun to learn new things about your favorite people!